Post: Gaurav Akrani. Date: 3/23/2011. Comments (22). Label: Insurance. The main objective of every insurance contract is to give financial security and protection to the insured from any future uncertainties. Insured must never ever try to misuse this safe financial cover. Seeking profit opportunities by reporting false occurrences violates the terms and conditions of an insurance contract. This breaks trust, results in breaching of a contract and invites legal penalties. An insurer must always investigate any doubtable insurance claims. It is also a duty of the insurer to accept and approve all genuine insurance claims made, as early as possible without any further delays and annoying hindrances. 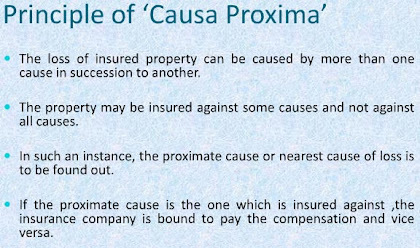 Principle of Causa Proxima (Nearest Cause). 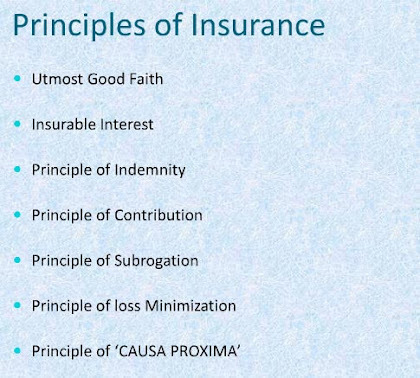 Principle of Uberrimae fidei (a Latin phrase), or in simple english words, the Principle of Utmost Good Faith, is a very basic and first primary principle of insurance. 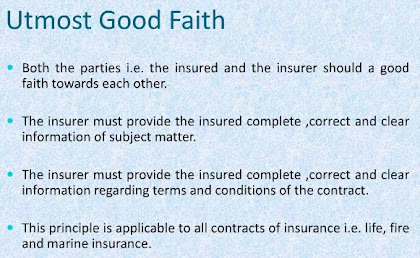 According to this principle, the insurance contract must be signed by both parties (i.e insurer and insured) in an absolute good faith or belief or trust. The person getting insured must willingly disclose and surrender to the insurer his complete true information regarding the subject matter of insurance. The insurer's liability gets void (i.e legally revoked or cancelled) if any facts, about the subject matter of insurance are either omitted, hidden, falsified or presented in a wrong manner by the insured. The principle of Uberrimae fidei applies to all types of insurance contracts. 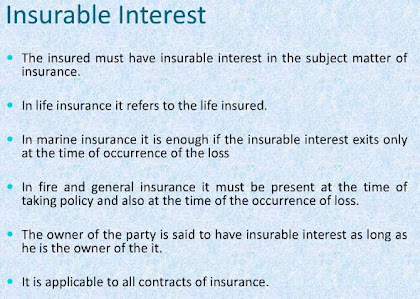 The principle of insurable interest states that the person getting insured must have insurable interest in the object of insurance. 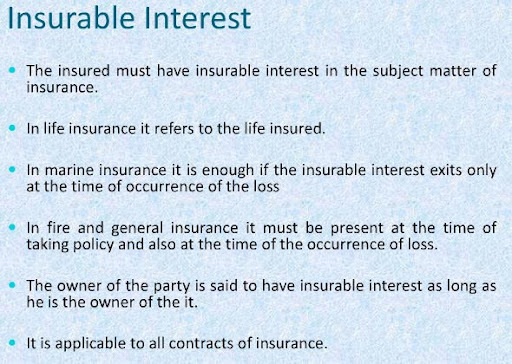 A person has an insurable interest when the physical existence of the insured object gives him some gain but its non-existence will give him a loss. In simple words, the insured person must suffer some financial loss by the damage of the insured object. For example :- The owner of a taxicab has insurable interest in the taxicab because he is getting income from it. But, if he sells it, he will not have an insurable interest left in that taxicab. From above example, we can conclude that, ownership plays a very crucial role in evaluating insurable interest. Every person has an insurable interest in his own life. A merchant has insurable interest in his business of trading. Similarly, a creditor has insurable interest in his debtor. Indemnity means security, protection and compensation given against damage, loss or injury. According to the principle of indemnity, an insurance contract is signed only for getting protection against unpredicted financial losses arising due to future uncertainties. Insurance contract is not made for making profit else its sole purpose is to give compensation in case of any damage or loss. In an insurance contract, the amount of compensations paid is in proportion to the incurred losses. The amount of compensations is limited to the amount assured or the actual losses, whichever is less. The compensation must not be less or more than the actual damage. Compensation is not paid if the specified loss does not happen due to a particular reason during a specific time period. Thus, insurance is only for giving protection against losses and not for making profit. However, in case of life insurance, the principle of indemnity does not apply because the value of human life cannot be measured in terms of money. Principle of Contribution is a corollary of the principle of indemnity. It applies to all contracts of indemnity, if the insured has taken out more than one policy on the same subject matter. According to this principle, the insured can claim the compensation only to the extent of actual loss either from all insurers or from any one insurer. If one insurer pays full compensation then that insurer can claim proportionate claim from the other insurers. For example :- Mr. John insures his property worth $ 100,000 with two insurers "AIG Ltd." for $ 90,000 and "MetLife Ltd." for $ 60,000. John's actual property destroyed is worth $ 60,000, then Mr. John can claim the full loss of $ 60,000 either from AIG Ltd. or MetLife Ltd., or he can claim $ 36,000 from AIG Ltd. and $ 24,000 from Metlife Ltd. So, if the insured claims full amount of compensation from one insurer then he cannot claim the same compensation from other insurer and make a profit. Secondly, if one insurance company pays the full compensation then it can recover the proportionate contribution from the other insurance company. Subrogation means substituting one creditor for another. Principle of Subrogation is an extension and another corollary of the principle of indemnity. It also applies to all contracts of indemnity. According to the principle of subrogation, when the insured is compensated for the losses due to damage to his insured property, then the ownership right of such property shifts to the insurer. This principle is applicable only when the damaged property has any value after the event causing the damage. The insurer can benefit out of subrogation rights only to the extent of the amount he has paid to the insured as compensation. For example :- Mr. John insures his house for $ 1 million. The house is totally destroyed by the negligence of his neighbour Mr.Tom. The insurance company shall settle the claim of Mr. John for $ 1 million. At the same time, it can file a law suit against Mr.Tom for $ 1.2 million, the market value of the house. If insurance company wins the case and collects $ 1.2 million from Mr. Tom, then the insurance company will retain $ 1 million (which it has already paid to Mr. John) plus other expenses such as court fees. The balance amount, if any will be given to Mr. John, the insured. According to the Principle of Loss Minimization, insured must always try his level best to minimize the loss of his insured property, in case of uncertain events like a fire outbreak or blast, etc. The insured must take all possible measures and necessary steps to control and reduce the losses in such a scenario. The insured must not neglect and behave irresponsibly during such events just because the property is insured. Hence it is a responsibility of the insured to protect his insured property and avoid further losses. For example :- Assume, Mr. John's house is set on fire due to an electric short-circuit. In this tragic scenario, Mr. John must try his level best to stop fire by all possible means, like first calling nearest fire department office, asking neighbours for emergency fire extinguishers, etc. He must not remain inactive and watch his house burning hoping, "Why should I worry? I've insured my house." 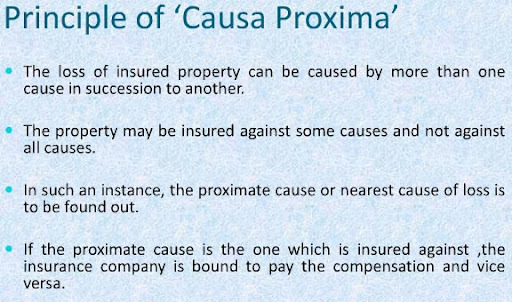 Principle of Causa Proxima (a Latin phrase), or in simple english words, the Principle of Proximate (i.e Nearest) Cause, means when a loss is caused by more than one causes, the proximate or the nearest or the closest cause should be taken into consideration to decide the liability of the insurer. The principle states that to find out whether the insurer is liable for the loss or not, the proximate (closest) and not the remote (farest) must be looked into. For example :- A cargo ship's base was punctured due to rats and so sea water entered and cargo was damaged. Here there are two causes for the damage of the cargo ship - (i) The cargo ship getting punctured beacuse of rats, and (ii) The sea water entering ship through puncture. The risk of sea water is insured but the first cause is not. The nearest cause of damage is sea water which is insured and therefore the insurer must pay the compensation. However, in case of life insurance, the principle of Causa Proxima does not apply. Whatever may be the reason of death (whether a natural death or an unnatural death) the insurer is liable to pay the amount of insurance. Thanks for highlighting the 7 principles of insurance. Thanks for sharing this article. 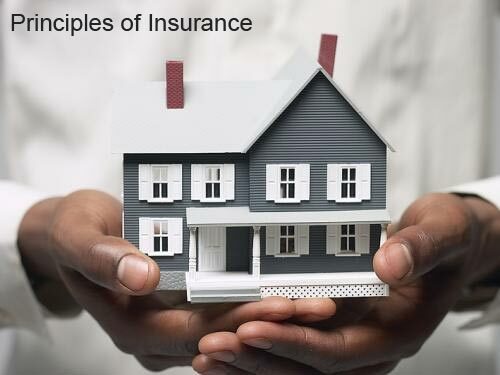 Its really helpful to understand Principles of Insurance. Really a great article depicting the concepts of insurance. It is also helpful for me as first time I am going to take car insurance policy for my car from BerkshireInsurance. Thanks again for the info.. THIS IS AN XTREMELY USEFUL SITE... THANKU... KEEP UP D GOOD WORK. I am taking a masters degree cause in Procurement and logistics. This happens to be the first lesson/lecture in insurance, what a bonus for me. Simple and clearly explained. 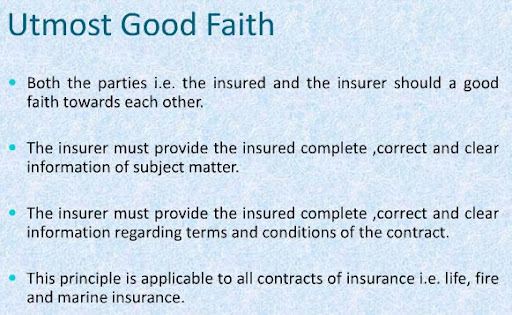 In as far as I know the principles of insurance these are the best ever explained principles, clearly and precisely. thanx for the good explanation atleast i can go for the interview well equiped tomorrow. Really good article. Well explained the principle of insurance! Thanks for sharing part of ur knowlege with us.This is very useful for insurance students nd those who want to insure their property nd their LIFE. IT IS REALY VERY INTERESTING BACK U THANK MAY ALMIGHTY GOD BE WITH U! Thank you very much for the good way in which you have explained the principles of insurance..I am better informed now. Am new to Insurance but have managed to understand these principles. Thanks for this article. It is really easy to understand and the explanation is good. Thanks once again. Thanks a lot for this article. I think I should be able to write something down in my exam tomorrow now. The article is really helpful for college students..Highlighting the points makes us understand it much easier.. 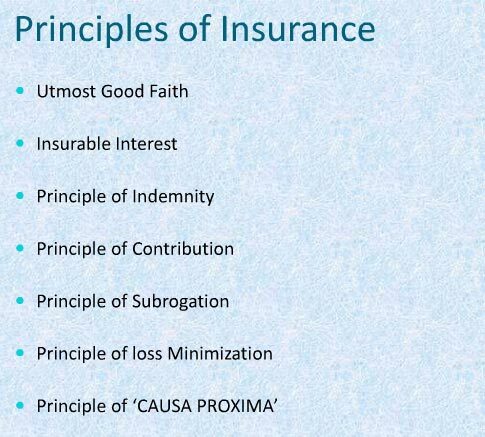 Explained in a simple manner....and it's useful for me in exams .......Thanx a lot for explaining 7 principles of insurance in a simple manner and understandable. This article is so superb, very simple and applicable. Thank you!! Thanks for writing a great article on insurance principle.